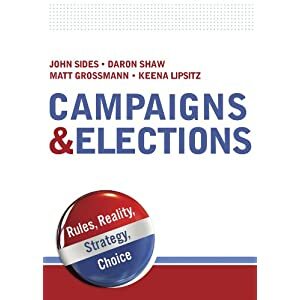 This is a guest post by political scientist Bernard Fraga, whose work focuses on the intersection of race and party in congressional elections. I solicited this directly from him, and we’re grateful for his quick response. In this post, I address the “present day” turnout situation, making use of a nationwide individual-level database of turnout records, compiled by Catalist, LLC. Focusing on the gap between African-American and non-Hispanic white turnout rates, I’ll show that recent state-level election results appear to back up the Court’s assertion that black voter turnout is often not substantially lower, relative to whites, in southern states. However, the narrow focus on state-level figures hides the fact that higher black voter turnout may actually be associated with VRA-mandated redistricting, instead of a robust sea-change in Southern politics. Two patterns are clear. First, the black-white turnout gap was substantially wider in recent midterm elections, relative to presidential elections. Nationwide, African-American voter turnout was approximately 15 percentage points below that of the non-Hispanic white population in 2006, and 12 points below white turnout in 2010. In 2008 and 2012, however, black turnout was within 5 percentage points of white turnout. 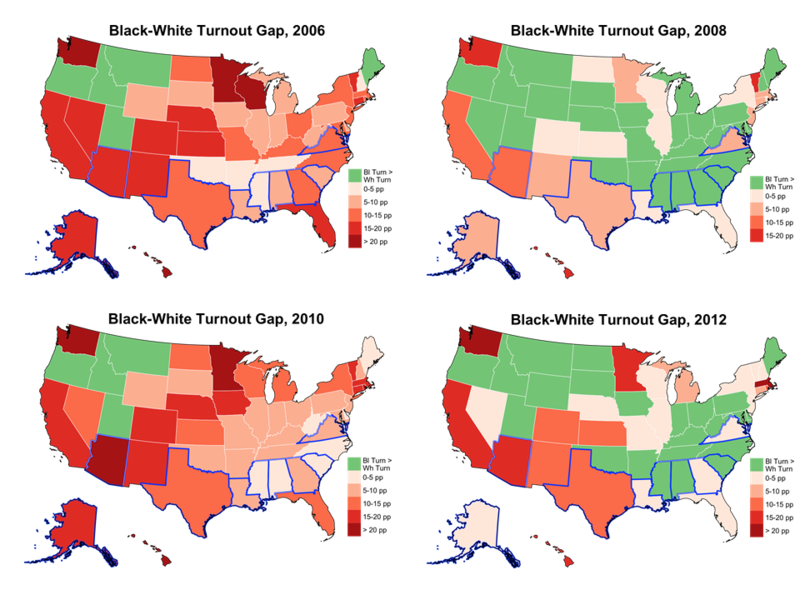 Despite recent gains, there is not consistent racial parity in voter turnout. The second pattern fits the majority’s conclusions in Shelby. In presidential election years, more than half of southern states subject to preclearance had black voter turnout equal to or exceeding that of whites, and with a smaller gap than many states in the North and Midwest. In midterms, while black turnout also lagged white turnout in the South, disparities were no more severe than much of the rest of the country. So far, it seems that the Court had an important point about the relevance of “40-year-old facts” to today’s political reality. 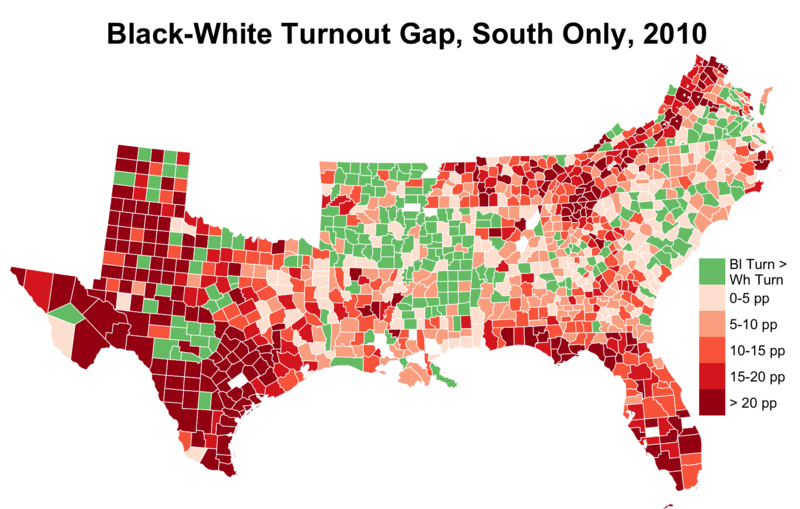 Yet, when we break down black and white turnout in the 2010 midterm by county, we see significant geographic variation in the black-white turnout gap within the South that points to the pitfalls of looking only at states. 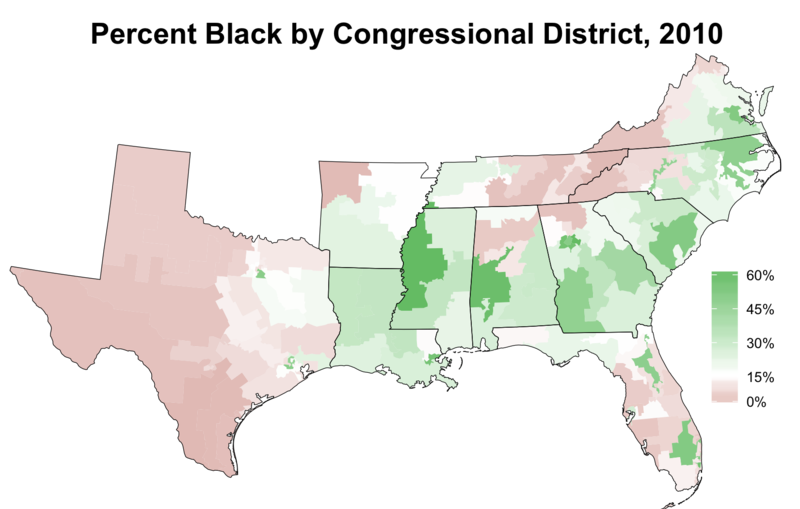 In the figure above, congressional districts with a black citizen voting-age population above the average for southern states (15%) are shaded in green, while those below the average are shaded in red. While not perfectly aligned in the figures presented here, nationwide evidence also suggests that black and Latino turnout is higher in majority-minority districts. In her dissenting opinion, Justice Ginsburg critiques the majority, stating “[i]n the Court’s view, the very success of Section 5 of the Voting Rights Act demands its dormancy.” When focusing on statewide measures of voter turnout in recent elections, we do indeed see that whole states subject to preclearance are no longer particularly egregious examples of low black participation. Taking a more detailed look at the South, though, suggests that VRA-mandated redistricting, now threatened by the Shelby decision (though perhaps not for some time), likely contributes to the high rates of black voter turnout cited by the majority. As opposed to a rosy “[t]hings have changed in the South” story, as cited by the majority, non-turnout metrics also document the continuing prominence of racial bias as a factor in Southern politics. When combined with even a slightly deeper analysis of turnout, as presented above, it is clear that the majority’s own narrow formula for “success” could miss the very conditions the Voting Rights Act sought to remedy. What if Marriage Equality Is Loving Instead of Roe? I wonder if the disparity in in turnout, in particular in Florida, is also partly due to the state’s restrictive law prohibiting felons from voting? many of whom are disproportionally African American.